Yesterday, I spent about 10 minutes making this free-form cherry pie. 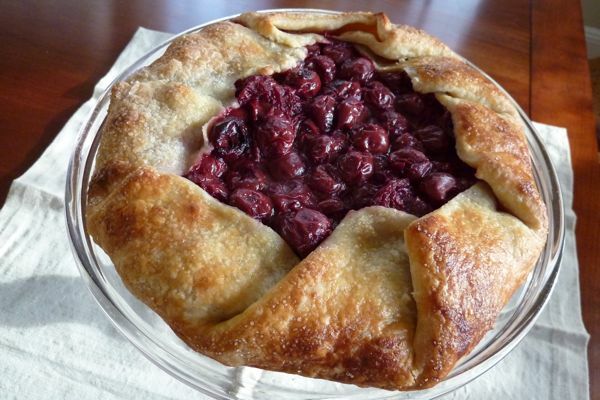 The cherries are jarred Morellos from Trader Joe’s but the homemade crust is Martha Stewart’s pate brisee, which had been sitting in the freezer and which, in my opinion elevates just about anything it wraps itself around to levels of unparalleled pastry brilliance. For the past few weeks every time I opened the freezer and saw the uncooked ball of pie dough waiting for me, the same happy thought popped into my head: Money in the Bank. It was the same way I felt eight years ago when I returned to my full-time job after maternity leave. My self-worth could be directly correlated to how many ounces of breastmilk I could pump and squirrel away on any given day. Andy used to catch me in the kitchen staring at the neat little row of Medela bags along the freezer door. “Are you counting your bags of breastmilk again?” he’d ask. Divide dough into two equal balls. Flatten each ball into a disc and wrap in plastic. Transfer to the refrigerator and chill at least 1 hour. Or freeze up to 3 months. Thaw at room temperature for about an hour before rolling out. Strain one jar of Trader Joe’s dark Morello cherries, saving about 1/4 cup of the syrup. Mix the cherries in a bowl with a squeeze of lemon, about 1/3 cup corn starch, and 1/4 cup of sugar. Ish. 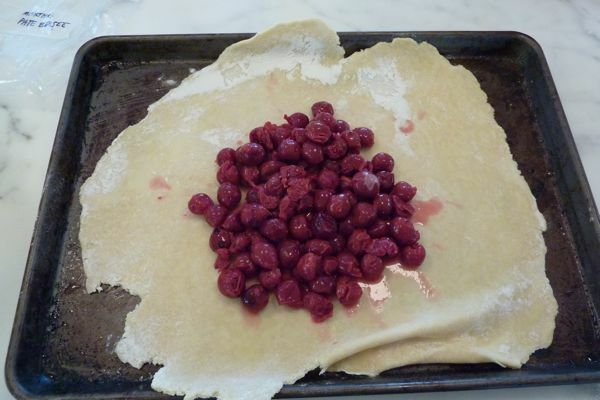 Pour cherries on to the rolled out pie crust as shown below. Fold the crust over, working around the fruit until it’s all wrapped up. Dot the top with a little cold butter. Brush crust lightly with a pastry brush dipped in egg wash and paint a thin layer around the crust. (You can skip this step, but it is what gives the pie that shiny golden-deliciousness.) Bake at 400°F for about 25 minutes until cherries get bubbly, adding drops of reserved syrup if the fruit is looking dry. If the crust is getting too dark too quickly, cover with foil and continue baking. Fill a dutch oven 2/3 of the way with water. Salt the water. Add the carcass of one roast chicken. Add whatever vegetables you have in the fridge — a peeled halved onion, 1 or 2 garlic cloves, mushrooms, herbs, peppers carrots. No need to do any peeling except for with the onion. Bring it to a boil, then reduce to a simmer. Simmer for at least an hour and up to 3 or 4 hours. Turn off heat and cool. Package in a few small individual freezer bags (see below) so you can easily thaw in small batches. Heat oil in heavy medium saucepan over medium heat. Add onions and garlic and sauté about 5 minutes. Add puree, oregano, sugar, and basil and simmer until thickened, stirring occasionally, about 1 hour. Season with salt and pepper. Turn off heat and let cool. On a weeknight, remove however many bags you think you need for your eaters, place in a bowl in the sink, and run warm water over them. Heat and serve with spaghetti or on quick french bread pizzas. I am just loving reading your blog! I find I’m spending more time reading it while I’m at work than I should, lol. Thanks for your focus on making meals that both kids and adults enjoy. My 7-yr-old son is at an all new picky stage and it’s killing me! Cheers! jenni – I’m so glad!! tell me what the issues are with your picky 7-year-old and maybe I can try to help. or enlist someone to help? dude, i’m in the breastmilk-bag-counting phase of motherhood! so glad i’m not alone. and if you think you were bad, guess what i do every time i go into the kitchen? make sure the freezer door is sealed tight. and guess what i think about every night before i go to bed? is tonight the night the freezer breaks? and if it is, then will i jump off a bridge or will i decide to keep on living for the sake of my child, even though i don’t deserve to be the mother of my child and she would be better off with my neighbor down the street who practically sells her milk she has so much of it? Paula – I think I’m in love with you. Is that weird? never having had the privilege of freezing breast milk (it never came in. [every time i read The Carrot Seed, i think about it in terms of breast milk, only–spoiler alert!–the book ends happily for the protagonist, and for me, it just meant i bought a case of Earth’s Best in defeat]), i now keep a greedy/proud/panicked eyed on all the bags of carefully marked cubes of food we’ve made for her, always figuring what will last longest, what she needs more of, and counting down the months until blueberry harvest at my cousins’ farm in Maine, so I can stop feeding her the (comparatively) junky frozen ones from TJ’s. And nothing gives me a sense of security like having at least 24 separate cubes of pureed steam d’Anjou pears…. 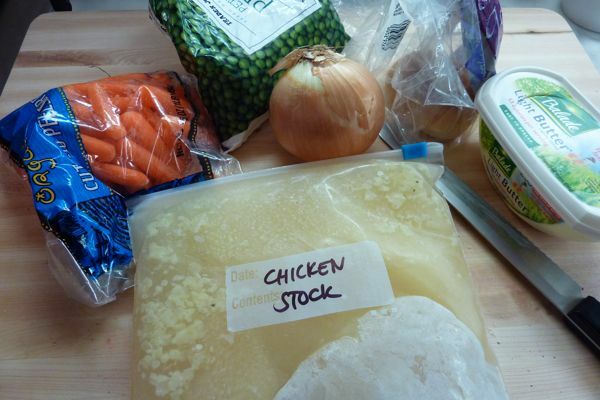 God, I remember those Medela Moments- looking at the freezer shelf and feeling either smugness or horror, depending on the amount of bags in there. I have always baked fruit pies (rewarding but exhausting)… until your blog taught me how to do a lazy apple galette- best dessert ever! Thanks. 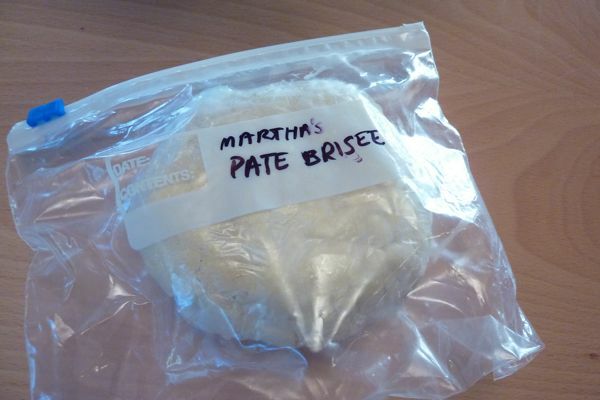 Could you sub bread flour for all purpose in your brisee recipe?